Unless you can be this awesome while doing it. 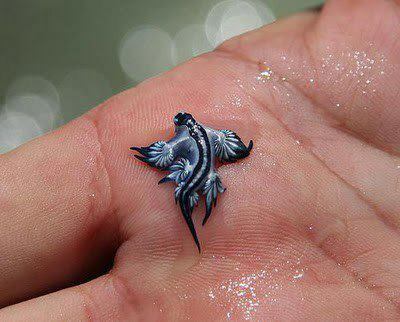 I saw this picture of a sea slug posted on Facebook book by I F***ing Love Science. I never paid much attention to slugs till I moved to Seattle and found them all over the place, like the blackberry bushes that also thrive here. Say what you want about Facebook and the crap people post sometimes, but I love the way you can also find little gems like this. Glaucus atlanticus is rarely seen except during periods of on-shore winds which bring them (and their prey) into coastal waters. Then, they can be found in numbers floating on the surface and, sometimes, even washed up on beaches. They are holoplanktonic, spending their entire lives drifting with the foot oriented toward the surface. They float partially by means of an air bubble that they have swallowed and stored in their gastric cavity and are able to move toward prey or mates by using their cerata to make slow swimming movements. They eat a variety of drifting prey including the siphonophore Physalia utriculus (Portuguese man-o-war) as well as the chondrophores Velella velella and Porpita pacifica (see photo). Occasionally, they will also eat each other. Like many other aeolids, they store the nematocysts from their prey in the tips of their cerata for protection against predators. Unlike in most aeolids, the sting can be felt by humans. via Glaucus atlanticus: main page. This entry was posted in Musings and tagged science, sea slugs by dborys. Bookmark the permalink.